Watched the movie "Fork over Knives" with my husband the other day. I had tried to avoid animal protein before watching this movie, but he LOVEs meat so I cook meat for him sometimes. But this movie makes me worried about his health! Even though he still doesn't seem to care about it, I've started looking into vegetarian recipes more than ever before. I found vegetarian chili recipe on food network. In a large, heavy pot, heat the oil over medium-high heat. Add the onions, bell peppers, garlic, and serrano peppers, and cook, stirring, until soft, about 3 minutes. Add the zucchini, corn, and mushrooms, and cook, stirring, until soft and the vegetables give off their liquid and start to brown around the edges, about 6 minutes. Add the chili powder, cumin, salt and cayenne, and cook, stirring, until fragrant, about 30 seconds. Add the tomatoes and stir well. Add the beans, tomato sauce, and vegetable stock, stir well, and bring to a boil. Add miso. Reduce the heat to medium-low and simmer, stirring occasionally, for about 20 minutes. Add rice cheese. And rice cheese to get the consistency of a thick soup. 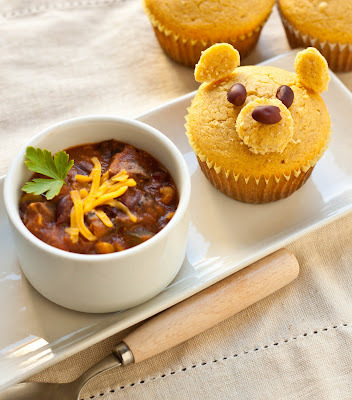 My husband loved this chili!! even though there is no meat in it. All you need is fried pasta and cookie cutters! Cut and put where you want to place the ears and nose. 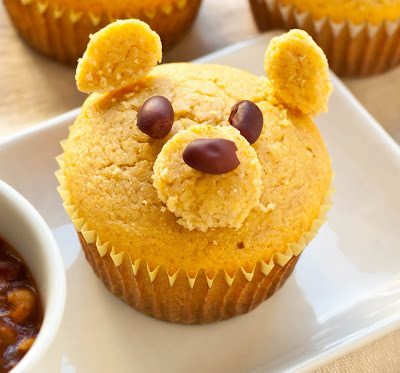 Make ears and nose using cookie cutters with another cornbread. Join the parts using the fried pasta.